The circles under the eyes are not a serious problem with the skin, but they make people look exhausted, elderly, and even ill. Some of the main reasons for dark circles around the eyes are: genetic factors, dry skin, unhealthy diet, often crying, long hours at the monitor, aging, mental or physical stress, lack of sleep, smoking. Also black circles under the eyes are a sign of anaemia, damaged blood vessels, hyperpigmentation, allergies or dehydration. 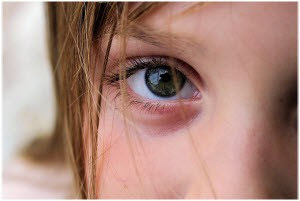 The skin around the eye is very delicate and thin, so that these circuits come out in the open. Since the skin in this area does not have sebaceous glands it needs special care. Both men and women of various age groups can have them, and we will hereafter give a fine proposal on how to remove dark circles, so be sure to stay tuned. Today there are a number of modern, medical methods for removing dark circles with laser or other. Although they have been practiced for many years, but we will take this opportunity not deal with them, and on the other hand we will offer 9 natural recipes after which the dark circles under the eyes will retreat, so let’s start. Cucumber is known for its capacity to whiten the skin, so it can help remove dark circles, plus it has a refreshing and calming effect. Cut fresh cucumber into thick slices, which need to be cooled in the refrigerator for about 30 minutes. Put cucumber on the affected area of ​​the skin for about 10 minutes. Rinse with water. Repeat the process twice a day for a week or more. Another way to reduce dark circles, is that the cucumber juice is mixed with lemon juice in equal quantities. With swab apply the juice on the affected area. Leave it for fifteen minutes, then rinse with water. This medicine apply once a day for a week. Almond oil is an excellent solution for sensitive skin. Regular use of almond oil will help cure black circles around the eyes. In addition to the almond oil, you can use the oil with vitamin E.
Before going to bed, apply almond oil over dark circles and gently massage it into the skin. Leave it overnight. The next morning wash with cold water. Use every day until dark circles disappear. In raw potatoes there are natural ingredients that can help whiten dark circles and remove the bags under the eyes. Grate one or two potatoes to extract the juice. Soak the swabs into the juice and place it on your closed eyes. Make sure the juice covers dark circles and eyelids. Allow it to stand for 10-15 minutes and rinse with cold water. Repeat once or twice during the day, in the next few weeks. Instead of potato juice you can also use thick slices of potatoes to remove dark circles. Tomato has bleaching properties that can restore serenity to your skin in a large extent. Mix one teaspoon of tomato juice with half a teaspoon of lemon juice. Gently apply on dark circles and let it sit for ten minutes. Wash your face with water. Use this drug once or twice a day for several weeks. You can also use tomato juice alone without the addition of lemon. It helps also to reduce dark circles if you drink tomato juice. You can drink some juice with the addition of mint, lemon juice and salt. For maximum results, drink the juice as soon as you make it. Drink one to two times a day for one week. Vitamin C in lemon juice can help fade dark circles around the eyes, thanks to its bleaching ability. Use the pads to apply lemon juice on the dark circles. Leave them for ten minutes and rinse with cold water. Just repeat once a day for one week. Another way is to make a slurry by mixing one tablespoon of lemon juice, two tablespoons of tomato paste, a pinch of flour and turmeric powder. Apply the mixture in a thick layer around the eyes, and after ten minutes rinse with clean water. Repeat two or three times every week. This is an amazing product for skin care. It rejuvenates the skin, has a soothing effect on tired eyes and serves as a good skin toner. Soak a cotton pad in pure rose water for a few minutes. Soaked pads put on closed eyelids for about fifteen minutes. During the few weeks of using this medicine twice a day the dark circles under the eyes will disappear. Caffeine and antioxidants present in tea can be a great solution to this problem. They act on reducing flatulence by reducing the blood vessels and lowering fluid retention. Tannin helps in reducing swelling and removing dark circles. Mint and chamomile also have a soothing effect on the skin. Cool two tea bags in the fridge. You can use green, black tea, mint tea and chamomile. On both eyes put the bags and let them sit for ten minutes. Remove the bags and wash your eyes. Use once a day for a few weeks. A cold compress constricts blood vessels and can serve as a simple cure for the removal of bags under the eyes, as well as to reduce dark circles. Soak a cloth in cold water or cold milk. Put a cloth on the closed eyelids for a few minutes. Also, you can put a couple of ice cubes in a tissue and keep it under the eyes for a few minutes, as well as a bag of frozen peas, chilled spoon and the like. You can use all of this couple of times a day and dark circles will eventually withdraw. Coconut oil is another natural way to remove the black circles. Coconut oil moisturizes the skin, makes it smooth and prevents wrinkles around the eyes. Simple massage coconut oil on the problematic area and leave it on for a few hours and rinse. Repeat two or three times a day for several months, or until you are satisfied with the results. Try to avoid eye contact with any of these products, as they can cause irritation and even violent reaction. If you like recipes for removing dark circles leave us a comment about your experience! How to remove dark circles that are very dark? Avoid rubbing the eyes, because it causes the expansion of blood vessels which form dark circles. Remove makeup before bedtime, and any composition which may irritate the skin. Reduce skin exposure to sunlight as much as possible, wear sunglasses. Drink plenty of water during the day to avoid water retention, but avoid increased fluid intake before bedtime. Quit smoking and regulate the intake of alcohol and caffeine. Apply eye cream containing vitamin K and retinol. The circles under the eyes can be caused by lack of vitamin K. Regardless of the cause, this cream for dark circles can reduce bags and dark circles. Long-term daily use has the greatest effect. Apply cream under the eyes. Then apply concealer to camouflage dark circles. It is important to use a concealer that matches your skin colour. If you have fair skin, use a colour that approximates the peach colour, while for darker skin, use a dark peach to orange colour. Colour correctors need to be 1-2 shades darker than your skin. Do not worry about the orange colour, it will be removed in the next step. If you do not use the foundation take a concealer that matches your skin tone and dab it over the concealer that you have already applied. This will alleviate the orange colour, and make it look more natural, but we can certainly advise you to use the base. Be careful when applying foundation, not to remove the concealer that you have previously applied. The aim is to equalize the concealer and foundation to get a natural look, and for dark circles to disappear. The next step is optional, but if you feel that the black circles under the eyes can still be seen, you can add a little brighter concealer. Choose a colour that is a shade lighter than your skin tone, make a couple of points on the bags under the eyes and slowly equalize with the brush. Before using any cosmetics test it on a small part of the skin to avoid allergic reactions. The best creams for the eye area are precisely the ones that will not cause any reaction on your skin, and as such are safe. While the black circles in adults are frequent, dark circles in children may indicate a serious health problem, and you are advised to consult a doctor for professional help.